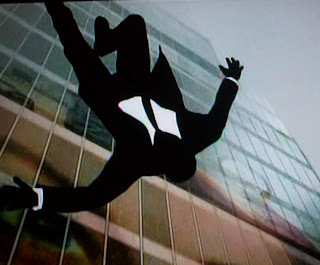 I was always mesmerized but never quite understood the Mad Men opening animation. But now it's all falling into place. Designer suit-wearing, slick and handsome ad man is nameless and faceless. Since everything is built on lies, he is ultimately alone and lives constantly in the shadow of his own demise. 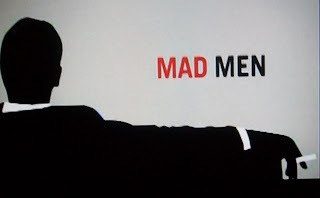 Have you met Don Draper? He is an anti-hero of the caliber of Tony Soprano, and why do we love him? For his charisma and his skill. He sells people on ideas. He is calculated and instinctive. He is the smartest man in the room. As a viewer I wondered why we were being sold that Don's wife Betty was the bad guy when she filed for Divorce. Yes Don is thoughtful, and a loving father, but his identity is a fabrication and he's been a serial philanderer. If it weren't 1963, Betty would have made minced-meat out of him in court. While the scenes documenting the final split are heartbreaking, the confrontation over Betty's "life raft" Henry Francis, and telling the kids that Dad is moving out, it is still the secondary storyline. There's Don's "other" divorce. When Don learns from Conrad Hilton that Sterling-Cooper is being sold for the second time in a year, the wheels go in motion. It takes just a few short days to turn Sterling-Cooper into a rogue ad agency that pirates the guts of the old agency in a weekend ransack. First Don convinces Bert Cooper, the company's patriarch to forgo his "golden tomb" to give it one more shot. Then he sells Roger Sterling. Then Layne Price, the London bottom-line-man assigned to gut (and unknowingly liquidate) Sterling-Cooper. Then he has to sell Cooper and Sterling on Price, "can any of you do what he does?" While balancing the time spent as his family is ripped apart, Don sells the once snot-nosed, now ever-evolving account man Pete Campbell to join in, if he brings his accounts of course. And finally Peggy, who takes a little more convincing. It's great to see elitist copywriter Paul Kinsey shattered when he realizes that Don took Peggy instead of him. Throw in the triumphant return of Joan Harris to whip their outfit into shape with her organization and logistical wizardry and voila, "Sterling-Cooper-Draper-Price." The nameless, faceless ad man once again exudes confidence, as he sits in his position of power. And what difference does it make what his true identity is? You'll believe whatever he tells you. You'll buy whatever he's selling you.